Legend Numismatics is proud to own and offer one of the all time greatest coins that exists. The extreme rarity of this coin places it on par with the greatest of classic rarities. This particular coin was highly sought after by the Pogue Family and they never obtained it -even with their extensive resources. It is estimated LESS then 20 exist. We too were determined to own it. We rank this coin as being SUPER HIGH END with claims to AU55 (we make NO promises). To start, the surfaces are fully prooflike. You do not need any imagination that there are mirrors. Overall, the surfaces appear clean. If you use a strong glass you can find tiny ticks scattered about (NON are serious). The luster is booming and does beam from all over. Both sides are a deep original yellow gold color with some splashes of reddish purple. 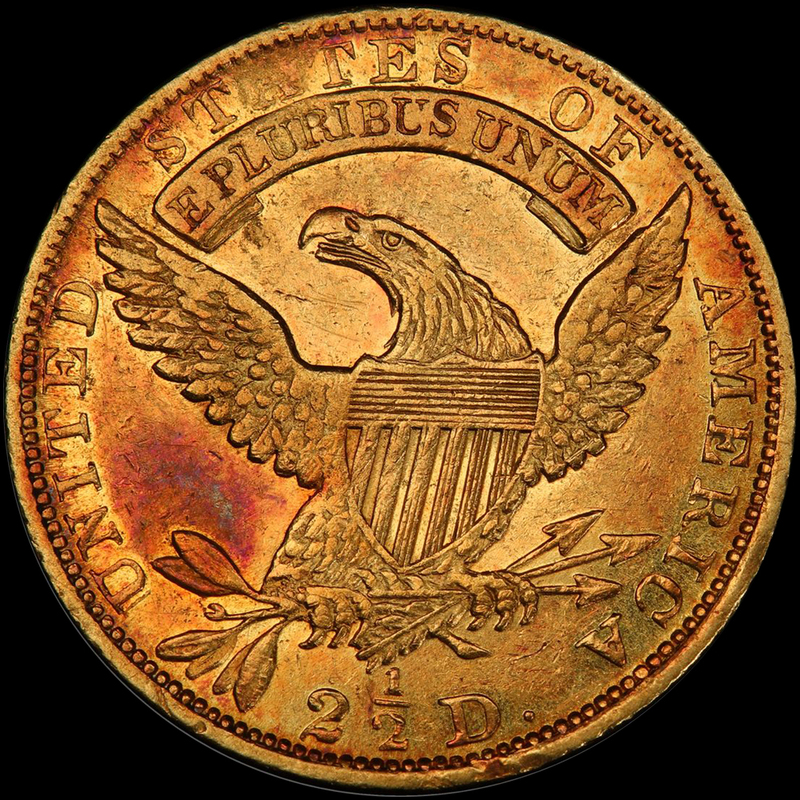 The reverse does NOT have a spot or stain-there is a patch of toning that matches the colors of the obverse. Miss Liberty and the details are well struck. Finding any strong wear is hard. This coin just oozes with originality. The eye appeal is tremendous! PCGS 1, NGC 0, CAC 1. THIS COIN IS THE ONLY PIECE BEANED BY CAC-OF ANY GRADE! WOW! Looking at when the last pieces traded for in other grades: AU50-1997, AU 55 2004, AU 58 2002, shows you a clearer picture of how rare these really are. 1804 $1’s have traded much more then these! Not only is this coin one of the few you will ever see, its also one of the few that is unmessed with and has great eye appeal and color. Once this once in a life time coin is sold-good luck EVER finding another even remotely close to the quality offered here. We think the value represented here has true unlimited potential. We think ANY AU PCGS CAC should be worth a minimum of $200,000.00. 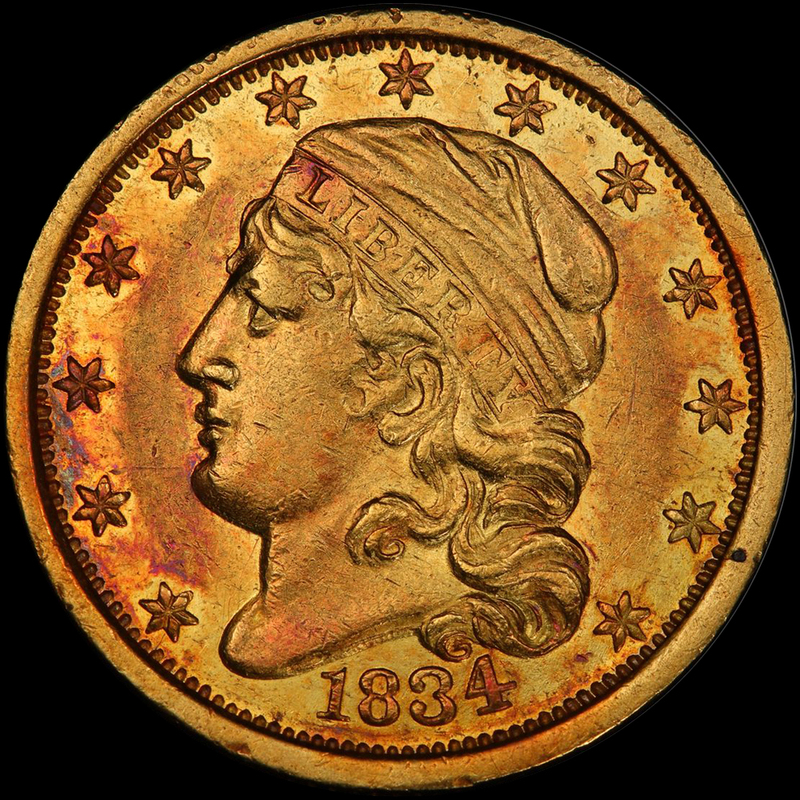 The date is one step behind a 1854S, in which an AU50 has a $425,000.00 Collectors Universe Value (an NON PCGS CAC XF 45 brought $345,000.00 in 2007). This is one of those grossly overlooked dates for sure (because it is that rare). Our President, Laura Sperber has always wanted to own an example. She has been a $2.5 Lib collector for 40 (yes 40 years). Until now, this is one date she has never owned (she has owned 2 1864 P’s, and one 1854S). Her resources to find and own one are also as great or even greater then Pogue. This is one bad to the bone rare coin if it only took 40 years! Do NOT even think the price is too much. Hold and the next owner WILL make a good profit down the road (unless the entire coin market folds).